Whether you are thinking of updating your kitchen or adding an entertainment center to the family room, understanding the differences between cabinet door styles will help you be sure you get the quality and look you want. The ultimate feel of your cabinetry is largely determined by door and drawer face selection. Although moldings, trim, fluting, and other millwork will enhance the look, the doors and drawers cover the most surface area. There are 3 main types of door and drawer fronts. These are Raised Panel, Recessed (or Flat) Panel, and Slab. Raised Panel is a traditional design where the center panel of the door is raised up, rather than flat. Recessed Panel is also known as Flat Panel. The center panel is lower than the frame of the door. Slab is a continuous panel that has no frame, and that makes them much less stable. For this reason, we do not recommend slab doors. You will learn about how doors are assembled in another section of this article. Where you see the word ‘Shaker’ in the chart, that is not a fourth type of door, rather a timeless and clean look that is named after the famous minimalist furniture designers. Notice the simplicity of Shaker styling, especially where the door frame meets the interior panel. That panel can be recessed or raised. Shaker is so classic and so popular, it nearly deserves its own category! Below is a close up of Shaker drawer fronts, fresh out of the finishing booth, and a traditional raised panel door front for comparison. 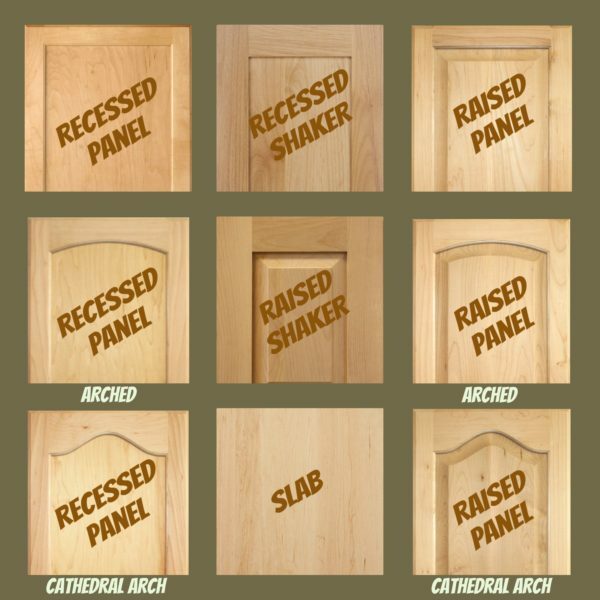 Our chart showed the most basic renditions of each door face (recessed, raised, or slab). Now we want to talk about the details – the kind that can make one raised or recessed panel door look completely different from another! That’s because both the inside and outside edges may have millwork detail for added effect. The inside boundary of the frame is called the Inside Edge Profile. The outside boundary of the frame is called the Outside Edge Profile. 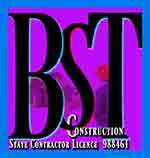 Industry terms for these designs include, but are not limited to, Bead, Bevel, Bullnose, Chamfer, Cove, Crescent, Eased, Flat, Miter, Ogee, Square, and Waterfall. Cabinet companies will typically have their own names for cabinet door styles. You will see names like Davenport, Cayhill, and Tahoe. This is to make selection a visual experience rather than having to know what the factory term for the millwork is called. Here’s a close-up of just a few of the options. The Frame is 4 parts, consisting of 2 Stiles (the sides) and 2 Rails (the top and bottom). The fifth piece is the center panel. To put the frame pieces together, there are 2 primary methods of construction. One is ‘Cope and Stick’ and the other is ‘Mitered’. 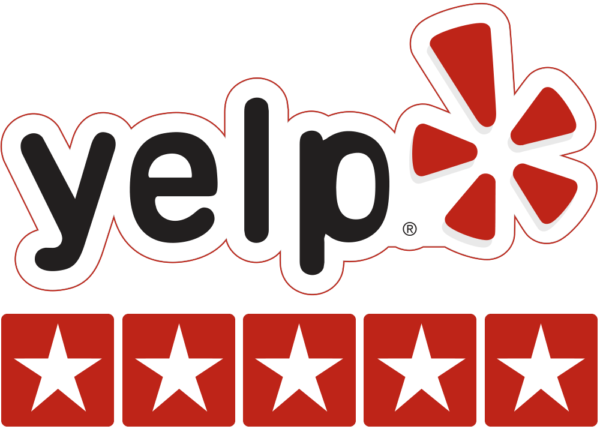 The difference is easy to spot and the quality of each is similar – although every millwork carpenter will have his own opinion on which is better. By looking at the drawing, you can see that Cope and Stick join the frame pieces in perpendicular, or right angle, fashion. The Mitered frame pieces are joined at a 45-degree angle. Most picture frames have mitered joints. And that’s it. The center panel actually floats within the frame, rather than being glued. The reason is that seasonal changes, such as summer weather, can cause wood to swell. Your choice of door face construction will not likely be a primary concern. One reason is that, as mentioned above, there is not a huge difference in durability or strength. Another reason is that, with proper construction and finishing, the seam lines will not be pronounced. In other words, the difference is hardly noticeable. 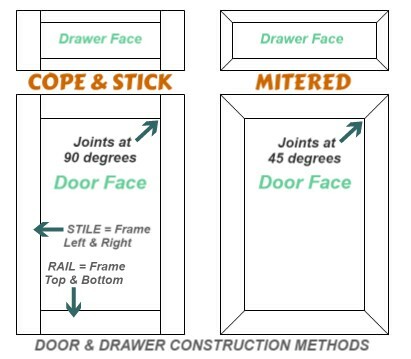 In order to make the proper door style selection, you should understand the basics of cabinet construction. This way you will know what to expect when you see the doors installed on the cabinet box. You may have heard the terms “Frameless” and “Face Frame” to describe cabinetry. The difference is simple but very important and will have a definite impact on the overall look and feel. By looking at the sketch, you can see that Face Frame cabinetry has a literal frame attached to the exposed edges of the box. That frame provides strength and the hinges and glides are screwed into solid wood. Frameless boxes have no frame and hardware is attached directly to the inside of the box (which is typically made from particleboard or other composite material). 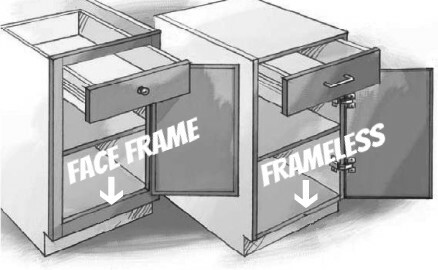 To read more about Face Frame versus Frameless cabinetry construction, visit our news blog by following this link: Face Frame versus Frameless. Now, let’s move on to the ways that doors can be hung on the box. And this is where the difference between cabinet box construction methods becomes relevant. Once you have chosen a cabinet door style, there are 3 primary ways that the cabinet maker can mount them to the box. These are Full Overlay, Partial Overlay, and Inset. Full Overlay covers the cabinet box or cabinet box frame entirely. In reality, there is still a tiny bit of a reveal, but you get the idea. Partial Overlay, which is also called Standard or Half Overlay, is the most common and you can see the frame behind and between doors. Inset places the entire door face inside the cabinet, such that the frame around the box is fully exposed. It is important to note that all of these options are available with Face Frame cabinetry, but not for Frameless cabinets. As previously explained, a Frameless cabinet box has no front facing frame around the opening, just the exposed edge of the box. These edges are covered over with a thin strip of wood or plastic edging material. 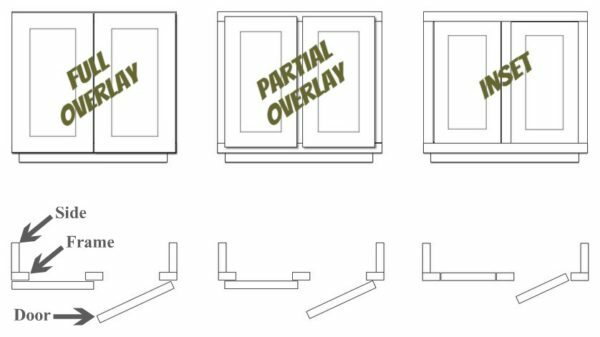 Bottom line, don’t expect a frameless cabinet company to show you a variety of door mounting options; full overlay is their only option. Now that you know about frames and cabinet box construction, here are a few examples of styling options to choose from. Some are for beauty, only, and others offer specific functionality as well. This custom wall cabinetry features a corner unit with a paned glass door and mirror at the rear interior to enhance the display. Accent lighting complements the design. The door style you see here is traditional, recessed panel. 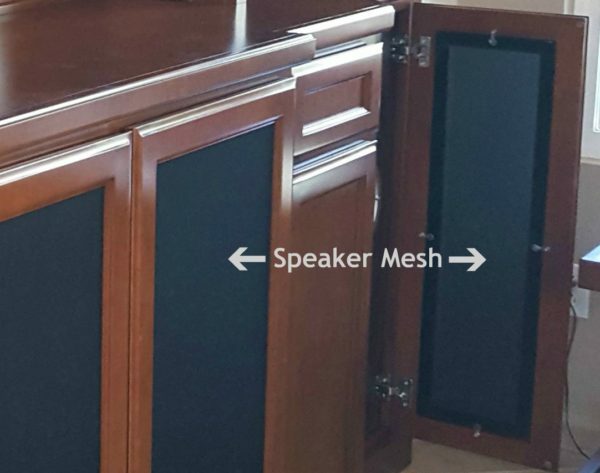 For audio visual component storage, the door panel inserts are replaced with black speaker mesh. The acoustic fabric allows sound from speakers and signals from remotes to travel. In addition, electronics stay cool, yet hidden from view. Lastly, you see a metal grille as the door panel insert. 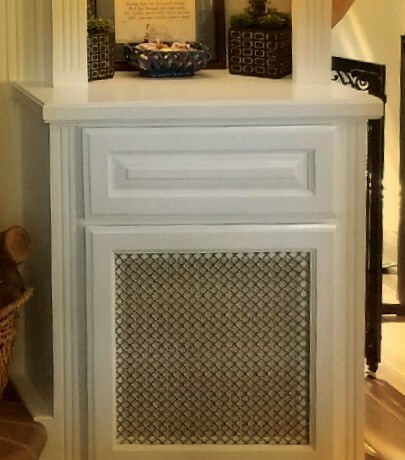 This one is Antique Grille and partially obscures the contents of the cabinetry. The grille inserts can be set diagonally, as pictured, or on the horizontal. In closing, the design team of C&L Design Specialists would like to wish you the very best possible cabinetry for your home. 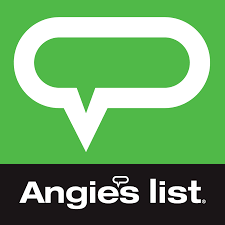 If you would like to learn more, check us out on the popular sharing sites and visit the news section of our website. 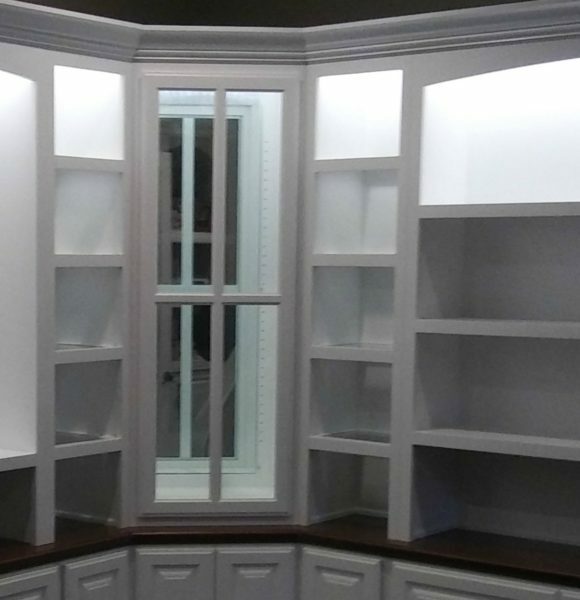 There is nothing like the quality of fully custom Face Frame cabinetry. And remember, with truly custom design, the possibilities are endless!